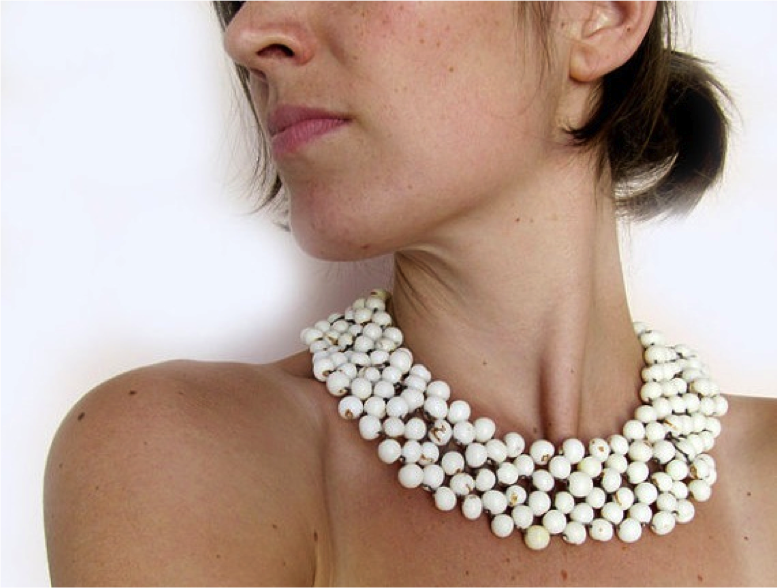 Justine Standaert of Justine Justine is a Oaxaca-based jewellery designer whose stunning work is deeply inspired by Mexico. 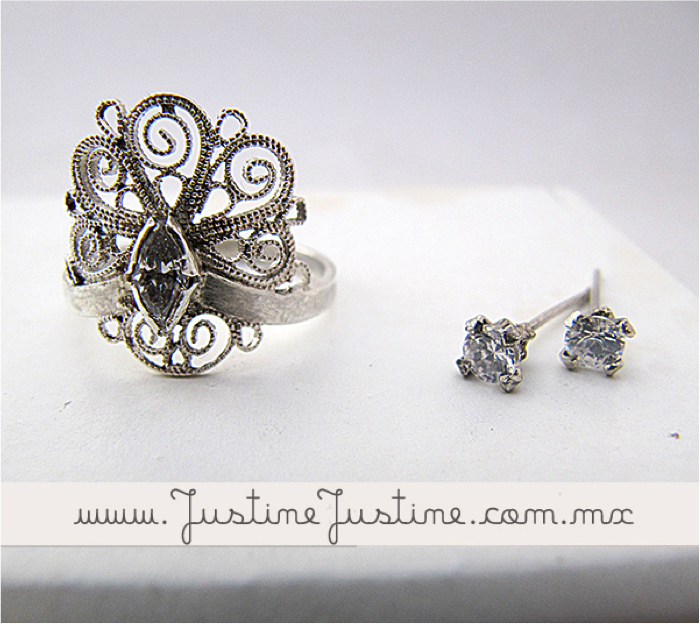 Recently Justine developed a range of contemporary filagree wedding jewellery that I just adore. Below is a fascinating interview with Justine about her love of jewellery, why she just can’t stop making it and what she loves about Mexico. In extra great news Justine has very kindly offered at 10% discount to Mexico Retold readers when you spend $50 USD or more on purchases from her website or her etsy shop. Just pop in the code VIVAMEXICO ENJOY! I have been making jewellery for as long as I can remember. When I was 14 years old I had made so many necklaces that I didn’t know what to do with them and that’s when I decided to step into a store and ask them if they wanted to sell my handmade jewellery, to my big surprise they said yes! And the very next day my necklaces were in their window! Did you have any formal training in jewellery design and creation? How did you come to realize your talent? When I first started, at 14 years old, I hadn’t had any training at all. At the age of 18 I visited Mexico for the first time and that’s when I had my first ‘real’ jewellery class from an American girl that was selling her jewellery on the streets of San Cristobal de las Casas in Chiapas. That day I knew that jewellery was what I wanted to do for the rest of my life. You use a lot of Mexican materials (bottle tops, seeds etc.). How did you first see their potential for jewellery? It all started when I was studying in Antwerp. The teachers insisted in expanding our horizons. We got to experiment with all kinds of uncommon materials for our collections. I quickly got into re-purposing and re-cycling. My final collections in my master-degree were 7 big necklaces in everyday materials like mirrors, nails, buttons, forks, etc. Has living in Mexico inspired the jewellery that you make? Absolutely! When I first started my Jewellery Design studies I had just arrived from a year of living in South Mexico, in a beautiful small town where I learned Spanish & made my own hammock. I had just travelled this amazing country and was in ‘awe’ of all the inspiring textiles, traditional jewellery and the intense colours! There was no way I could get all this beauty out of my head, my heart and my soul. Since the first time I came to Mexico it has become one of my major inspiration sources. I use materials, shapes and symbols that tell a Mexican story. Inspiring Mexican icons like Frida Kahlo are a huge inspiration too. What do you love about making jewellery? It is addictive. I can’t stop. I tried once to stop making jewellery: my last year in Antwerp, there were only 6 of us graduating and we all felt pressured to make conceptual jewellery. Teachers often pushed us to make un-wearable jewellery because in their days that was their way of reacting against former jewellery styles. My generation was leaning towards jewellery that could be worn. Why call creations jewellery if it is too big/too sharp/too crazy to wear? I really struggled with those concepts and I graduated with a bad feeling. I decided that the jewellery-world was not for me and that I was not going to make jewellery anymore. I really tried to quit haha, after 3 weeks I was making and selling jewellery again. It is part of me. The challenging part is all about finding a way to make it work. Intriguing jewellery has to fit a body, it has to look good and it has to tell a story. Once you figured it all out you can just let your hands lead you to do the making. I see you have a new collection of filigree jewellery. How do you approach a new collection? From where do your ideas evolve? Most people see it as a ‘new collection’ but for me it is going back to the beginning. It was time to pick up silver again and to use the old school techniques that I learned years ago, here in Oaxaca to make some contemporary pieces. I love the combination of old & new. You can see it often in Oaxacan fashion too. Designers like Silvia Suarez and Fabiola Calvo use the classic embroidery in their modern clothing. 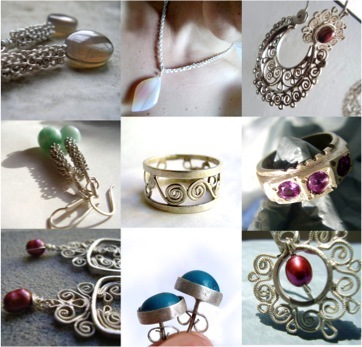 My contemporary filigree collection is similar. I love to do research on the classic Mexican jewels and start from there, evolve it into unique pieces of modern jewellery. Which other jewellery makers do you admire? 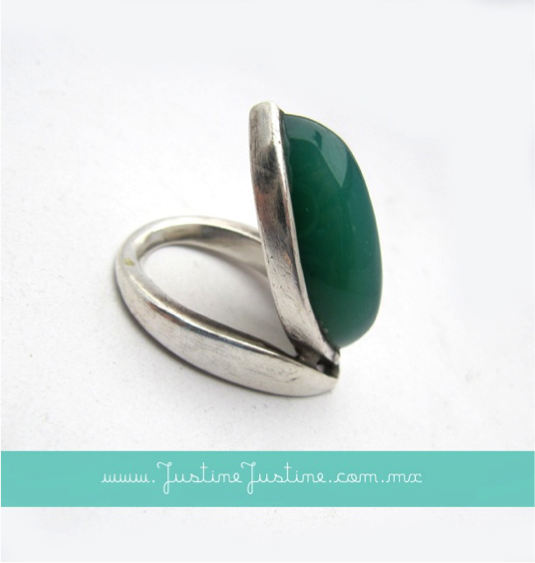 You also make custom-designed jewellery. Do you have a special tale of a particular piece of work you loved or a piece you made for a special occasion? I have my special ‘lucky’ ring that I designed and made myself when I was studying in Barcelona. I wear it on every special occasion or when I need an extra bit of good luck. It symbolizes my work as a jewellery designer and even though people have wanted to buy it from me, I will never ever sell it. It represents too much and you have no idea how much luck it gives me. I adore making engagement or wedding rings, they are all special to me because the couples take me on an inspiring journey. It is incredible to design jewellery that reflects their love and their story and will become the most important piece of metal in their lives. There is nothing like it. Every day is different here at ‘the office’. My husband and I work together and we take on the biggest part of the work that has to be done. I do all the communication with my lovely customers myself because I think it is the structure of my business and it plays the most important role in the design process. Good communication is key! We divide all the tasks between us and if there is more work than hands we get help from 2 extremely talented co-workers. Even though every day is different they all begin and end in the same way: Every morning I print the orders that came in overnight. Then we pack what is ready and we decide on a deadline for the pieces that are made to order. Every workday ends with a walk to the post office to ship the orders of that day. After I put the kids to bed and the hubby is off to play with the band (lachinasonidera.com) I often edit pictures and upload the new items to my website and etsy-shop. What is your career highlight thus far? Plenty of amazing things have happened, but I think the real highlights for me are the days when magic happens. When the piece of jewellery, my customers, and me as a designer, connect in a special way. I always remember that one day I noticed that on 2 of the orders the last names and the addresses were the same but the first names were different. I thought: well, 2 sisters ordered separately without knowing, maybe I can ship the orders together. I wrote one of the 2 girls and the following happened: it turned out to be a mother and daughter that had bought gifts for each other in my shop without knowing! Those kinds of stories just touch my heart. The same with designing engagement rings, or bridal jewellery. I get involved in the personal process of magical love of our customers that can’t be compared to anything else. It is truly special. What’s your most popular-selling piece of jewellery? That changes over the seasons but this necklace brought our business to the next level, it became really popular years ago and it was even featured on the famous blog Design*Sponge in an article about Frida Kahlo. Every season different colours become popular, we’ve had a ‘lime green’period followed by a ‘Yellow’period and so on…. Our contemporary filigree is pretty popular too, people contact me to have their custom-made engagement rings or wedding bands made and that is what I love the most! What do you love most about living in Mexico? 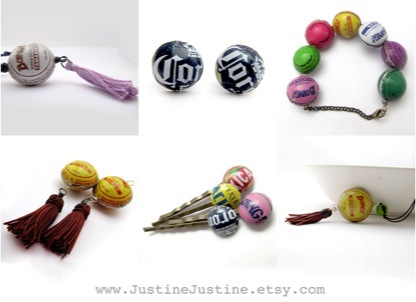 Check out Justine’s jewellery on her website and her etsy shop and don’t forget the discount code VIVAMEXICO to get your 10% discount on orders of over $50 USD. Love her story, love her jewelery! Hello, I am a beginning jewelry student and while I have experience soldering and the basics, i would like to learn much more about working with silver in jewelry. do you teach jewelry in oaxaca? i would like to take a class or two this summer and would love to visit oaxaca. if you don’t teach classes, do you know someone who does in oaxaca? thanks so much if you can offer any help.